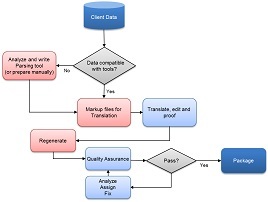 Our engineers will go beyond making the basic steps to get your content localized. They will critically analyze your data and code and help you structure it and code it right so you can avoid any future re-work. Due to the variety of technologies, programming languages, file formats, and several other factors, a process is needed to help the translator focus on the linguistic aspect of localization and to protect the client's data from any elements that can corrupt them (code, format, etc.) In addition, localization involves technical elements that go beyond adjusting the linguistic component of applications (e.g. need to change character encoding). Given the above, localization engineering involves preparing data for translation, re-integrating it after the translation is done, and making any adjustments necessary to ensure that the deliverable is technically correct. Our engineers have in-depth knowledge of a wide variety of platforms and technologies. Our expertise includes thorough knowledge of localization engineering best practices, as well as all public localization and translation tools, including translation memory, machine translation, terminology management, and process workflow systems. We can also assist you in product development in all popular programming and scripting languages and operating systems.